Sub-Saharan Africa is home to large and growing populations of Christians and Muslims that often live side by side. But when it comes to education levels, there is a big gulf between the two groups: Muslim adults are more than twice as likely as Christians to have no formal schooling. Among adults ages 25 and older, three-in-ten Christians in sub-Saharan Africa have not completed even a year of primary schooling (30%). But among Muslims in the region, fully 65% have no formal education – a 35-percentage-point difference with Christians, a new Pew Research Center analysis has found. The gap exists even though Muslims in the region have made considerable gains in formal schooling in recent generations. Between the oldest and youngest adults in this study (those ages 55 to 74 and 25 to 34 in 2010), the share of Muslims in sub-Saharan Africa with at least some formal schooling (one year of primary schooling or more) doubled, rising from 21% to 43%. But these gains have not been as large as those made by Christians over the same period. 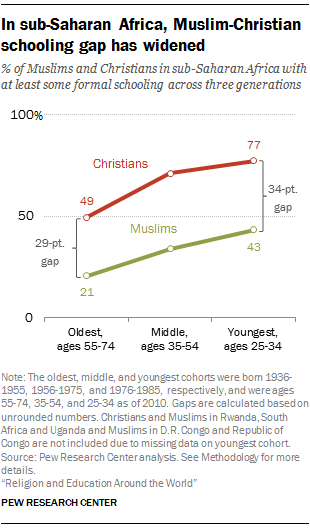 As a result, the Muslim-Christian gap has actually widened across generations. 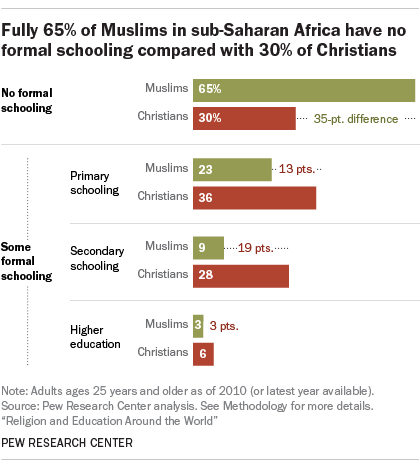 In 18 of the 27 sub-Saharan African countries with substantial Muslim and Christian populations, Muslims are more likely than their Christian compatriots to have no formal schooling by at least 10 percentage points. The gap is especially apparent in West Africa. In Nigeria, for example, where Christians and Muslims each make up about half of the population, roughly six-in-ten Muslim adults (61%) have no formal schooling, compared with about a quarter of Christian adults (26%). 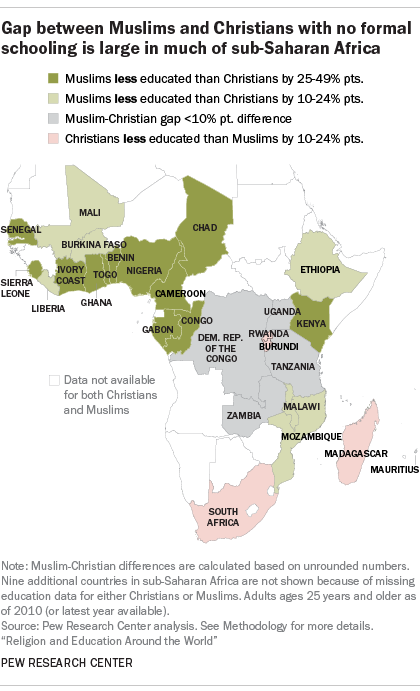 Muslims are more likely than Christians to have at least some formal education in a handful of countries in the region, including South Africa, Rwanda, Madagascar and Burundi. In all of these cases, however, Muslims are a small religious minority, making up 3% or less of those countries’ national population. Although Muslim women are the least educated group in the region, with 72% of them having no formal education, the Muslim-Christian gap in formal schooling in sub-Saharan Africa is not due to a wider gender gap among Muslims relative to Christians. Muslim men also trail Christian men and women by large margins. In fact, 57% of Muslim men have no formal schooling, compared with 36% of Christian women and 22% of Christian men. In trying to account for the gap, scholars generally agree that Christian missionary activity in Africa during the colonial era is a key factor. Protestant missionaries were particularly active in establishing schools and educating local populations, motivated by their belief that everyone should be able to read the Bible in their native language. However, many areas that are majority Muslim today, such as northern Nigeria, did not benefit from the legacy of schools built by missionaries. In addition, many Muslims were reluctant to send their children to missionary schools, out of fear that they might be converted to Christianity – a suspicion that, scholars argue, continues to shape attitudes toward state-sponsored educational systems among some Muslims in the region. Note: To learn more about some of the factors behind the Muslim-Christian gap, read our interview of Melina Platas, an assistant professor of political science at New York University Abu Dhabi. For more details on how the data in this post were obtained, see the Methodology section of the main report.